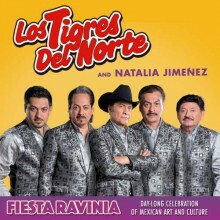 On September 17, Ravinia celebrates Mexican Independence day with Los Tigres del Norte and Natalia Jiménez. The day-long celebration starts at 2 p.m. and features many different activities and vendors throughout the park. Note: many more activities will be confirmed soon. Visit this page soon to see what we add to this already action-packed day! Decamping from Mexico for sunny San Jose, CA, when he was barely a teenager, Jorge Hernández, together with three of his younger brothers—Hernán, Eduardo, and Raúl—and cousin Oscar Lara, initially traveled north in search of jobs to support their family back home. However, in forming the band Los Tigres del Norte, they found much more than steady work as musicians, quickly earning a voracious following with their original songs emphasizing contemporary social issues and other themes that spoke to the experience of Mexican-Americans. The band began playing in parks and on local radio broadcasts once the quintet arrived in California in the late 1960s, but they were soon given the opportunity to record their corridos and quickly tapped into a massive audience with “Contrabando y Traición,” a ballad about a woman who shoots her drug-running lover and takes off with the money. Always socially conscious, Los Tigres set themselves apart from other corrido performers by never glorifying the criminals in their ballads. Los Tigres’ ascent to fame turned their genre of norteño music, previously localized to the Mexican-American border, into an international sensation, with Los Tigres as its foremost icon. The band has also since been named one of the 15 most influential Latin artists of all time by Billboard, have won several Grammy and Latin Grammy Awards across their vast discography, and recently received a star on the Hollywood Walk of Fame. Los Tigres del Norte first played Ravinia in 2008 and returned last summer to headline Fiesta Ravinia. Singer-songwriter Natalia Jiménez took to the subway and streets of her native Madrid with her guitar at age 15, then solidifying her goal of making music for a living. She got her first big break as the lead singer of the group La Quinta Estación, performing the theme song (“Dónde Irán”) to the telenovela Clase 406 and then scoring a number-one hit in Mexico with her song “Algo Más” off the group’s 2004 sophomore album, Flores de Alquiler. Jiménez would continue to have a hand in writing over half of the tracks on the group’s next two albums, the Latin Grammy–winning El Mundo Se Equivoca (2006) and the Grammy-winning Sin Frenos (2010), scoring further hits with her songs “Me Muero,” a number-one hit in Mexico and Spain, and “Recuérdame,” which featured Marc Anthony on the recording. Jiménez announced that she was embarking on a solo project in 2010, following her guest appearance on the Spanish version of Ricky Martin’s song “The Best Thing About Me Is You,” and she delivered her first single, “Por Ser Tu Mujer,” the following spring, with her eponymous solo-debut album appearing two months later. She began work on a follow-up album in 2013, releasing what would become the title track, “Creo en Mi” the following year. Around the same time, she joined Telemundo’s La Voz Kids TV series as a coach, remaining with the series for the 2015 and 2016 seasons, coaching the winning singer both years. Creo en Mi was released in early 2o15 and featured “Quédate Con Ella,” which joined the title track as a top-five Latin Airplay hit. Last winter, Jiménez released an album in tribute to Jenni Rivera, Homenaje a La Gran Señora. Natalia Jiménez is making her Ravinia debut.